If you’ve been around InspyRomance a while (long enough to experience a Sunday Edition or two when I’ve been on), you might have realized that I enjoy doing a few crafty type things. I taught myself to crochet when my husband and I were first married (mostly because we barely had two nickels to rub together and we had friends who were pregnant and I had no idea how we were going to afford a baby gift, so I figured if I could make them a baby blanket it would really only cost me some time.) My mom taught me to knit one winter break in college when I wanted to make a more meaningful gift for my boyfriend (now husband). 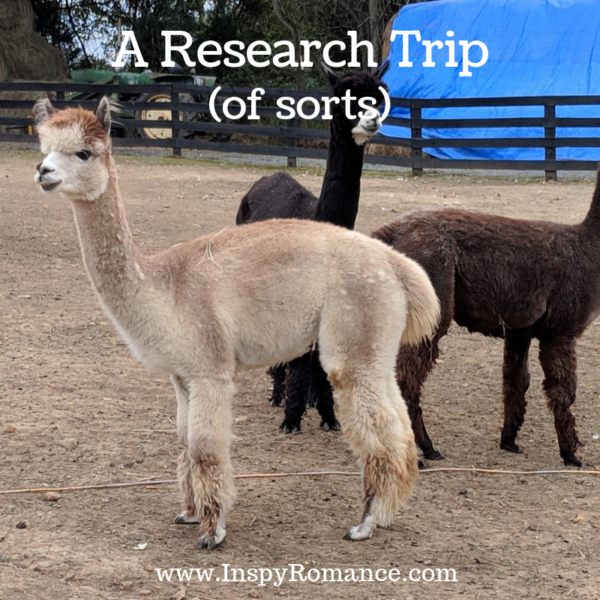 In September, I blogged about my husband’s (and my – but he was there first) love of llamas and alpacas and how I finally have a way to incorporate into a story world for him. And in October, I found a way for my love of crochet and knitting to combine with hubby’s llamas and alpacas AND my need for information for my upcoming story. See, our friends all pretty much know about my crafts and hubby’s llama thing, so periodically, we’ll get a text or an email with an interesting link. The most recent was a friend texting me a link to a nearby farm that was offering a drop spindle spinning class. What sort of farm? An alpaca farm. (They do also have sheep.) 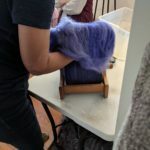 I’m pretty sure that even non-writers who enjoy fiber arts would jump at the chance to learn how yard is made and give it a go themselves. I don’t usually need to do a ton of research for my books, so when you throw in how cool that will be for my future book? I was there. We started our class with an introduction to the alpaca herd. Then she got one and brought it outside so we could pet it and get a little more up close. The alpaca in question was the white one you see on the title image. Her name is Athena, and she spits. A lot. Big, globby snotty spits full of half-chewed alfalfa. She didn’t get me, but not all of our class of six was able to escape her benediction. 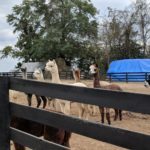 We learned all sorts of fantastic information on how to raise alpacas for their fiber. It was fascinating. From there, we moved on to her herd of sheep. She has I think forty sheep in two different varieties. All their animals are fiber animals, meaning they’re raised for the wool they produce each year. It was fascinating to see the difference in the coats on the animals and then see and feel the different type of yarn those coats produce after processing. That said? It was so much fun. I’m looking forward to getting to incorporate some of my new knowledge into a Hope Ranch book in 2019. And speaking of my Sunday Edition craft updates – here are my two projects as of today. 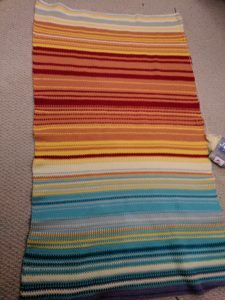 The shawl is finished and the temperature blanket is nearly complete – just a few more weeks left in the year! Are you crafty at all? What do you like to make? If you’re not crafty, is there something you’d like to learn? I am not very crafty- my mum taught me how to knit and crochet but I am not that great at it, mostly because I don’t practise!! I do enjoy taking photos, particularly when we are outdoors on an adventure, though it is very much just for my own fun. Photography is something I wish I was better at. My did tried to teach me when I was a teenager (he’s very into it with multiple lenses etc) but…it’s a lot for me to remember all at once. Hi Elizabeth! Thanks for sharing. For Vacation Bible School one year we had a farmer bring a sheep and sheer it, while we watched and we were able to feel the uncarded wool. On several occasions I have watched wool being spun into yarn, which definitely takes practice and is back breaking. I find the spinning and weaving process fascinating. I am not very crafty – though as a child my mother taught me to embroider. In college my roommate taught me to crochet. As a newly wed during the lean seminary day, I crocheted lots of scarves, shawls, afghans, and Christmas ornaments. While my mother was great at cross stitch, I did a lot of plastic canvas work – pictures, toys for my sons, coasters, and Christmas ornaments. Now life has too many interruptions and when tired my brain has trouble concentrating. Elizabeth, thanks for sharing not only the story, but the pictures. I also enjoy taking photos and making photo books for family and friends. Happy Thanksgiving. Best wishes. How fun that you got to see a shearing! I would like to see that in person. Hi, Liz! Thanks for sharing the details of your trip! I am looking forward to reading your llama story, lol!! I just adore your crochet projects! I crocheted only one blanket in my life…when I was bedridden during pregnancy with my son… one and done, lol! I so admire your dedication to the temperature blanket, that is very awesome! The way writing is going those poor alpacas and llamas are going to be waiting a while, but I really am hoping for 2019! 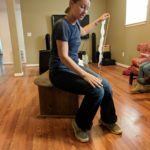 I loved reading about spinning. 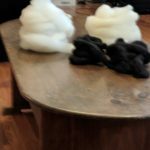 I know from reading, how hard turning wool into yarn is. I knit some. I wish I had more time in a day . . . My grandma tried to teach me how to crochet and knit, but I didn’t care when I was 12. I Have taught myself how to knit, thanks to YouTube, and keep thinking I could learn crocheting the same way. I look forward to reading your book with the llamas! More time in the day would be great! Of course I’d probably find more work to do instead of using it to relax! They spit? That reminds me of a camel! No, I’m not crafty at all. I had an aunt who had Downes Syndrome – she could crochet and knit with the speed of lightening! LOL! She tried to teach me to crochet when I was nine years old. I just was not teachable! 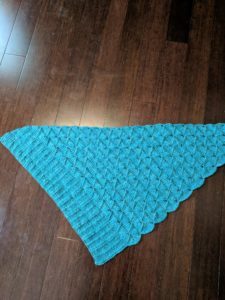 Your two projects look GORGEOUS! I love that shade of blue! And yes, like camels. Theyre all considered “camelids” so they’re related. 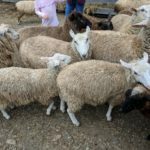 My inlaws raised sheep for a few years – hubby’s siblings were in 4H – so I’ve had the joy of middle-of-the-night lambing, watching lambs cavort in the pasture, participating in shearing (I did not do the deed! ), washing/carding the fleece, and making duvets from it. In the past six months — for the first time in my entire life!!!! — we’re not sleeping under a homemade wool duvet, but it’s still wool (Daniadown). My MIL used wool from our sheep to knit many a jacket and pairs of socks. I used to do a lot of crafty things, but knitting and crocheting were two I never got into. (Can we still be friends???) I sold Creative Circle needlecraft kits for years, loving cross-stitch, crewel, and fine embroidery in particular. I also sewed a lot when my kids were young. Now my eyes are shot and those things are behind me. I do have one felt stocking to embellish with embroidery before Christmas. It’s my youngest granddaughter’s second Christmas, but I didn’t have the strength of mind to do the work last year after my heart attack, so it’s on the agenda for the next few weeks. Can’t wait for your alpaca story! My great-grandmother lived with us when I was about 8, and she taught me enough knitting to make a potholder. Later I made a winter scarf, but that was it. I wish she had taught me to crochet, as I think I would have kept up on that better. I did do a lot of crewel embroidery over the years, and then when counted cross-stitch came along, I made a lot of wedding and baby presents. I found time to do it while we were watching the evening news on TV after supper, or during meetings. Now I don’t watch the news on TV (read it on the Internet) and in the meetings I go to now, I’m the one taking minutes. I need to get back to it, however, as a niece is having a baby girl next spring, and she needs a counted cross stitch picture! If you want to try crochet, there are some great YouTube videos, but it all depends on how you learn (sometimes learning from a video is harder than if it was in person.) Crewel is so pretty – I was never good at that, though my grandma tried to help me! I’m into scrapbooking and making greeting cards, although I have done some knitting before. I used to be crafty, but not so much anymore. I’ve tried cross stitching, painting glass ornaments, stenciling T-shirts, making ornaments out of pinecones, making candles, sewing blankets and curtains, and simply coloring. Most of these things I did when my kids were younger or I in my pre-kid days. I recently made a blanket, but for the most part I think my crafting days are behind me. I really love seeing those temperature blankets! I find my craftiness comes and goes with whims. My resurgence this year is after a several year hiatus. Thanks so much for sharing. How fun! I love how the temperature blanket is coming out, and the shawl is beautiful! I also crochet, though I mostly either make baby shoes and hats for friends having babies, or plush animals for the kids LOL I haven’t done a lot of crocheting this year, but hopefully will again soon. I also love photography. I enjoy taking our family photos every fall along with lots of fun snapshots throughout the year. I’m so envious of people who can take good pictures. Diaper cakes are very cool. I crocheted and quilted but my vision and arthritis in my hands changed that.